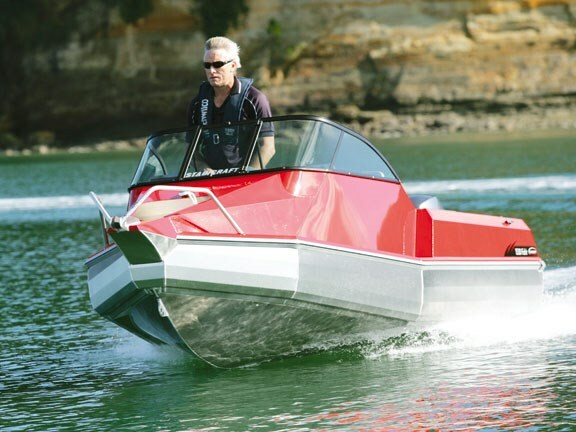 It’s common knowledge that Stabicraft has a reputation for building solid and stable boats designed to handle any conditions. We got to test this reputation on a windy old day on Auckland’s Hauraki Gulf. 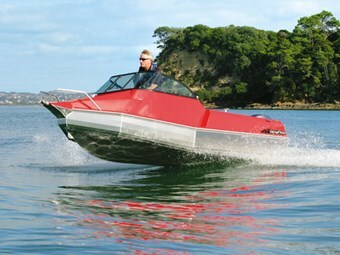 The 1530 Fish’r is the successor to Stabicraft’s most popular model, the 459 (launched in 2002). There is little change from the well received design; the most notable being the walk-through windscreen and a change in the name – 1530 representing 15.3 feet instead of the previous 4.59m metric measurement. The change has been brought about to standardise the sizing across the Stabicraft range, and also fits better with the company’s North American export market. Stabicraft boats aren’t known for their pageant-winning good looks, but this one will certainly silence many critics. The interior is no-frills and quite spacious for a boat of this size – as the name "Fish’r" suggests, this Stabi is built purely with fishing in mind. 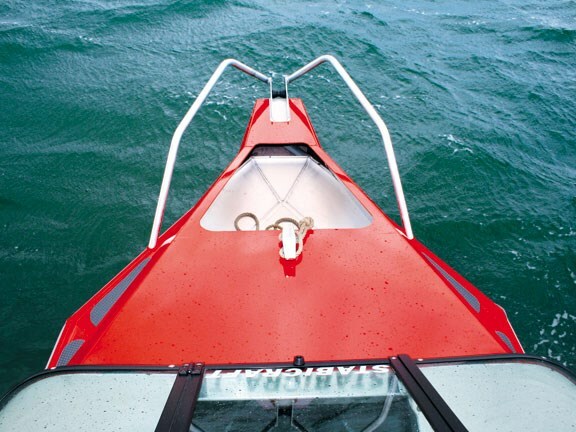 All Stabicraft are built to order, and apart from the shiny red paint job, our test boat was fitted out to standard specs. There are loads of optional add-ons available to suit. Accessing the anchor is as easy as twisting two catches and folding back the walk-through windscreen. Once up front there is a solid fairlead, complete with a roller to haul the anchor over and straight into the spacious, self-draining anchor locker. The high bow rails provide something solid to grab onto if required and when deployed, the anchor can be tied off to the sturdy cleat. There is good quality non-skid on the sides and bow section. The cockpit floor is tread plate, which provides good grip and is also fully sealed. This facilitates the 950 litres of reserve buoyancy underneath – the trade-off, of course, is no under-floor storage. Tube floor matting is also available for greater comfort. 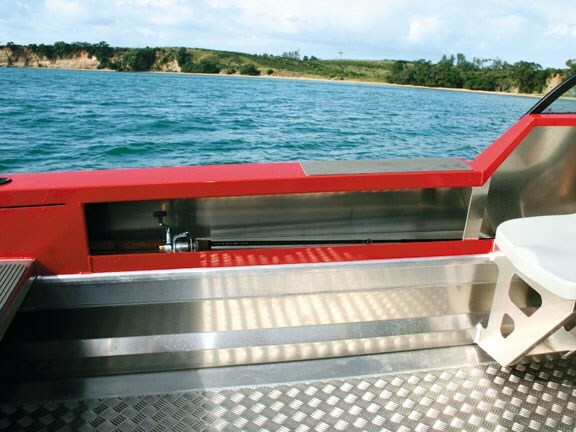 There is a small section of non-skid on the gunwales for safe on-water boarding, but unfortunately only two rod holders are available as standard. Underneath are large parcel shelves that extend the full length of the hull – capable of storing all but the longest rods. There is a handy compartment up front for stowing your other gear. At the helm, digital Yamaha gauges providing speed and RPM feature on the dash, and there is space to mount a GPS/fishfinder on the shelf beneath the windscreen. The passenger also gets the equivalent shelf space plus a dash-mounted handrail to grab onto. Seating is provided by twin cantilevered seats that swivel 180 degrees and have small storage pockets beneath. The transom is of the walk-through variety. While we took on some water over the back while fishing due to the day’s stormy conditions, this is no problem as the self-draining duck bills quickly cleared any water once we were underway. A bilge pump and well can be optioned, as well as a raised transom. For family fun there is also a solid ski-pole that doubles as a bait-board mount. At only 5.9m long and 1.95m high on the trailer, this little red demon should squeeze into a standard garage. Within a few minutes of the lines hitting the water a nice kahawai was landed. Say no more! The uncluttered cockpit allowed two of us to cast soft-baits and move around each other with ease. This is also where the excellent stability comes into play, as there’s no need to worry about both standing on the same side to land your catch – this boat hardly notices you’ve moved. Cleaning up after a messy fishing session should be quick and easy due to the tread plate floor and self-draining cockpit. The battery box is also on a raised shelf to stop any fishy bits from hiding out. I put the throttle down and gave the photo boat a run for its money through the chop, which reached a metre at times. 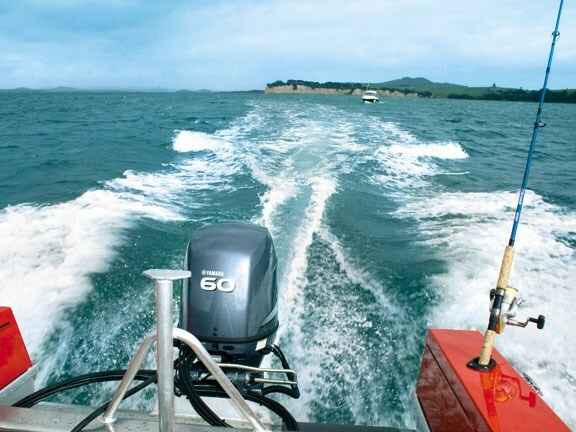 With the outboard trimmed in we skipped across the head sea relatively comfortably at speeds up to 35km per hour. We only had to button off a couple of times when the odd bigger one rolled through. 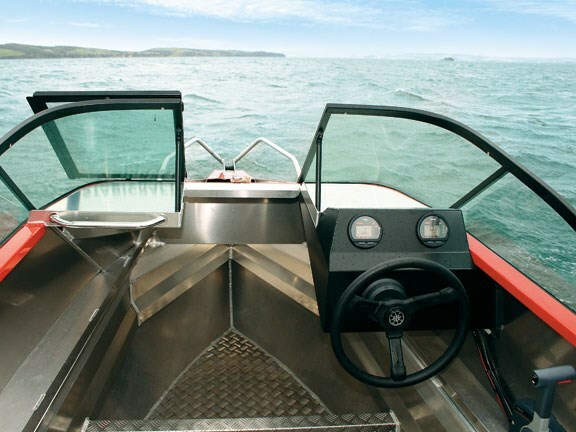 When tackling the waves beam on, which would cause a conventional hull to lean over dangerously, the GII pontoon design kept the boat level with only so much as a small sideways shift on contact. The windscreen is at a good height and deflected wind and spray straight overhead so I stayed nice and dry. The helm set-up is at a good level, with the throttle in easy reach, and I felt comfortable driving seated throughout the test, not needing to stand to get a better view. Once safely back in calmer waters it was hammer down time and the quiet Yamaha four-stroke topped out at 60km per hour with two people on board. This engine is at the top of the recommended range and, as expected, the hole shot performance was very good and there was little transition onto the plane. 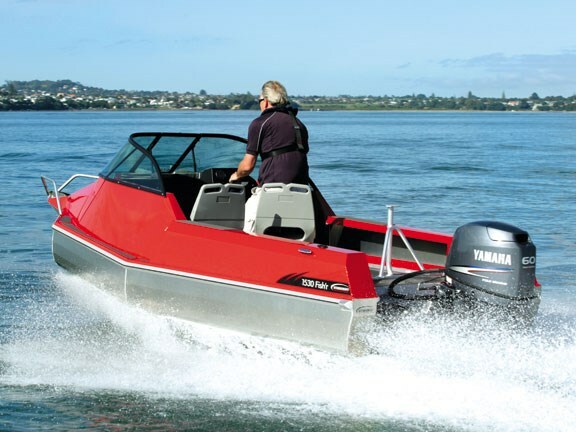 If you don’t need the extra grunt, a downgrade to the recommended 40hp four-stroke would represent very economical boating indeed. Turns were tight and the boat stayed level throughout thanks to the pontoon design. The hull gripped well even when turning over the wake. Some prop cavitation was evident when giving it too much throttle in the tight turns, but only when giving it a real good nudge. The cable steering system was smooth and responsive and, combined with the receptive throttle, made this boat a lot of fun to throw around. 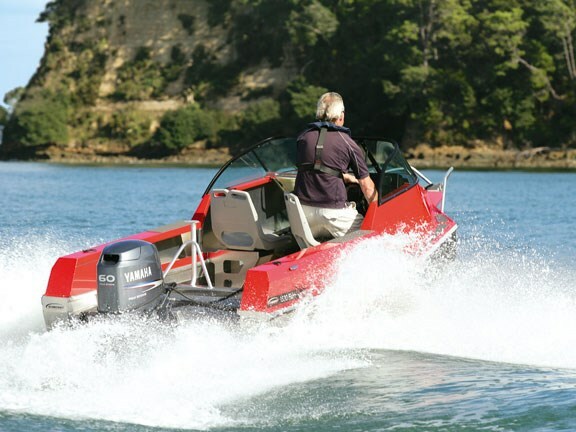 This is a great little boat that is capable of much bigger things than its size suggests. Delivered at a price and size that’s easy to handle, it represents great entry level boating – getting out on the water hassle-free with the peace of mind of knowing that if the conditions take a turn for the worse, it will get you home safely. See Stabicraft boats for sale.